Something I’d eaten the day before was not agreeing with me, and I worried that I wouldn’t survive the short journey to our closest track. I arrived at a damp and drizzly Mallory Park feeling very weak and wondering if I could get away with an open face helmet and Nomex Pampers! Pushing the car up the hill to scrutineering I realised just how weak I was, with my heart nearly pounding out of my chest and sweat pouring off me. Luckily, adrenalin works wonders for shutting down all of your bodies non-racing functions, and once I was strapped into the Sheane I felt much better! The first few laps of qualifying were pretty much dry, which helped me learning the track. My previous bike trackday here wasn’t much of a help, as for that we used a chicane at the Esses and after the hairpin, but I at least knew to expect the blind crest on the exit of Gerrards. I settled into the lines but was still struggling to find 2nd gear at the tight hairpin – getting around there was more trying to get a gear rather than any kind of technique to cornering. 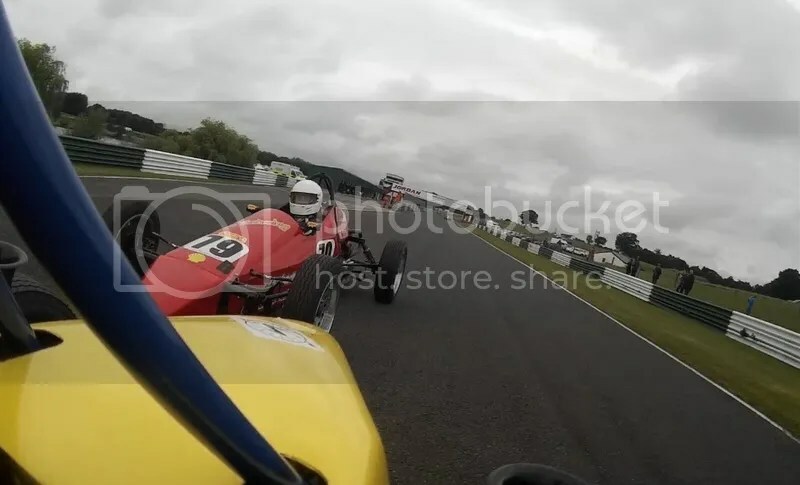 I had a brief tussle with Andrew Cooper in his first ever race weekend (he’s going to be quick), and overtook him going into the very fast Gerrards corner on the inside. A faster car came up behind me as I made this pass, so I held my inside line exactly as we’re told to do. 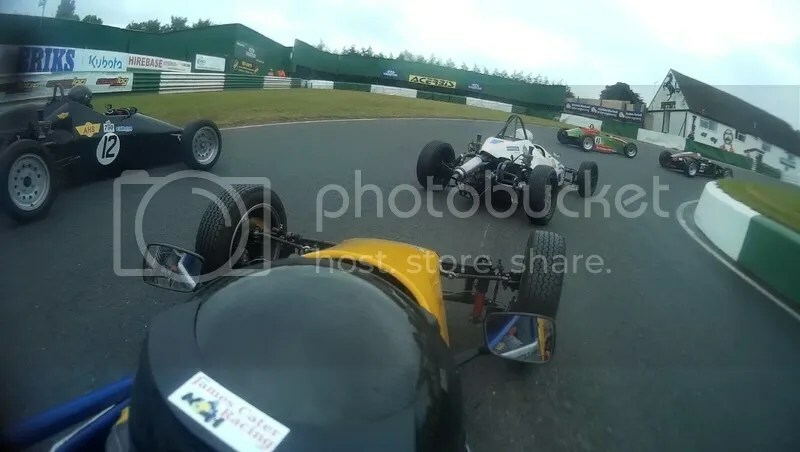 Apparently the more experienced driver wanted me to disappear somewhere or drive off ‘his’ track, as he came up to me after the race being sarcastic about my mirrors working. When I pointed out I was trying to qualify as well, and asked what I should have done, he walked off. Pretty bad form – it’s all very well criticising a new driver but if you have no answer as to what they should do for next time, you don’t do yourself or the sport any favours! Despite the bad taste this left in my mouth (and I don’t just mean the sickness returning as the adrenalin wore off again! ), I was pleased with the qualifying session. We’d come 18th, but I knew there was lots more to come from just about everywhere on the track. 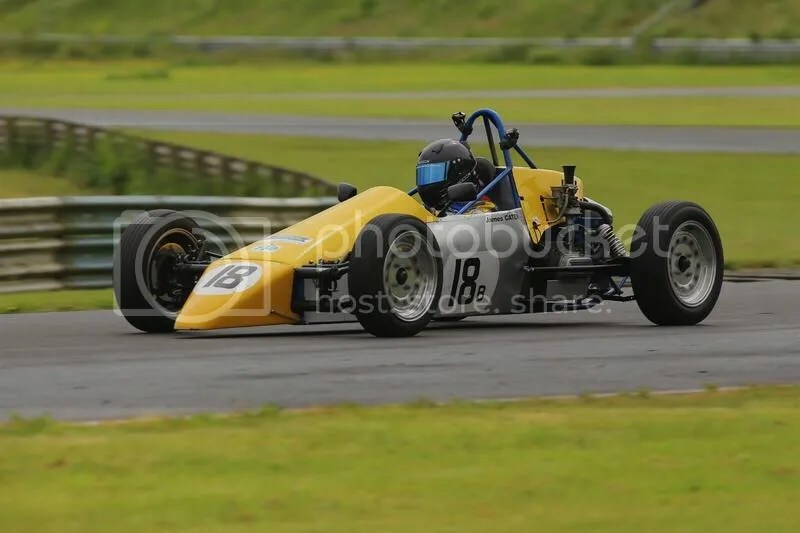 The Z-bar had stayed attached, confirming that it wasn’t breaking at Croft due to the changes we’d made lowering the rear of the car, and so we should be able to dial in some faster set-up again. The light rain faded as we lined up on a now wet track for the race. I made a decent start, picking up a few places but being very wary of the concertina into the hairpin. A few cars had spins early on, and Jamie Harrison had a huge opposite lock slide around Gerrards right in front of me that looked very impressive – well held! I could see Jake Hockley and Colin Gregory with a few others in front of me, but then after some more shoddy gear changes at the hairpin I fell off the back of the group, and a couple of the earlier spinners recovered and went by. I had another brief battle with Andrew Cooper before he pulled away out of the hairpin. With the bit of space I had, I was then able to concentrate a little more on that problem, and by the second half of the race I’d finally found a way! I found that going from 4th to 2nd just didn’t work at all, but if I went to 3rd and then had a brief pause before selecting 2nd gently, it liked it a lot better. I’d found that I was pretty quick into and around the Esses, especially when I trail-braked in, and although still way off the leaders, I was ok going into Gerrards, and through it, but despite having my foot flat to the floor on the exit the cars just ahead were still pulling away from me. The car wallowed quite a bit through Devils Elbow, and I had to lift there to bring the back around on the adverse camber or the front started dragging me wide and upsetting the rest of the car. I’d been warned off making the front too stiff, but now think I was heading in the right direction, and need to firm it up again. If we ever get a proper dry race again, anyway! 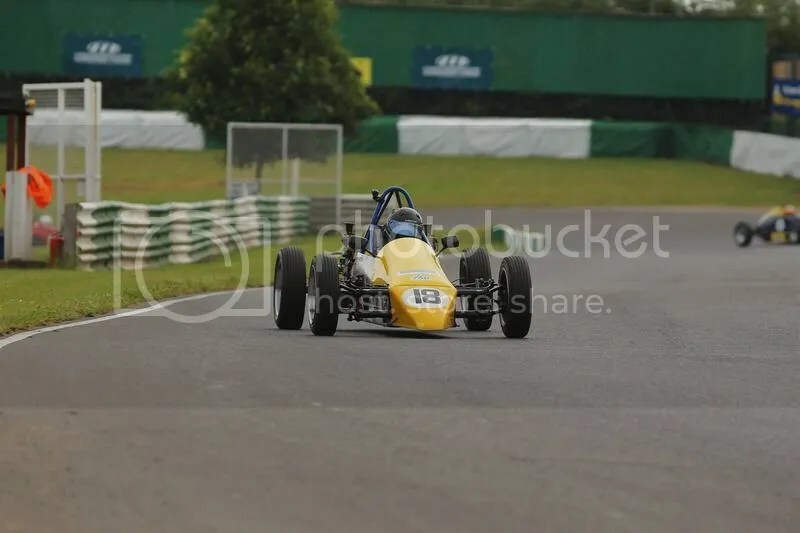 Coming home 5th in class and 18th overall wasn’t too shabby as a learning experience, and it seemed I was surviving the weakness of the food poisoning! Starting from the same grid position but this time in 17th place (eh?? I just went where they told me to! ), I was hopeful of getting another good start on the again wet but rapidly drying track. The lights went out and I dropped the clutch quickly, but the revs were the only thing going anywhere! I slammed the lever from neutral into first, as the cars behind missed me and shot off into the distance. It wasn’t red mist that descended over me as much as a very focused calm, knowing I had some recovering to do. I picked a few off, then gained a couple more places when some mild carnage at the hairpin put some cars wide, my new-found 2nd gear abilities coming in handy, and then blasted up the inside of Tom Roper (another relative new driver who did have a few Vee races over 10 years ago, now returning in Peter Studers hire car) into the Esses. 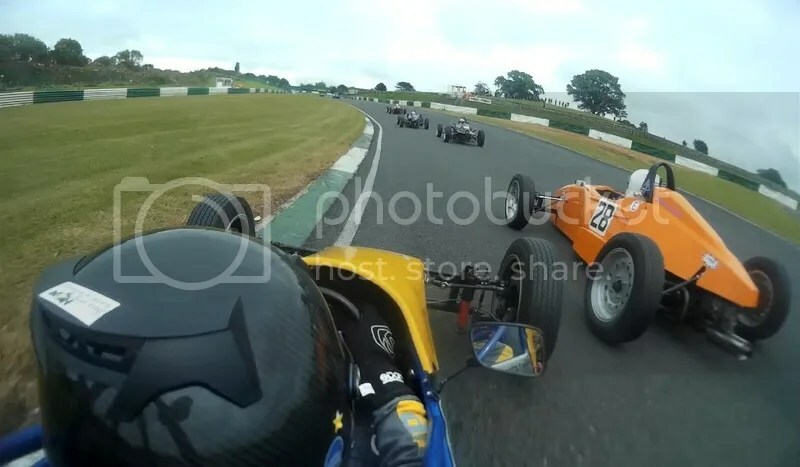 This seemed to wake him up a bit and he followed hard on my tail as I pushed up to another group of four battling cars – Colin Gregory, Jake Hockley, Jamie Harrison and Andrew Cooper. I’d caught them quickly, but trying to get by a group of 6 cars fighting that closely wheel to wheel was easier said than done! It was 3 or 4 wide into every corner, and if you didn’t commit to a pass someone else would dive straight down the other side of you! It’s the first time I’ve ever been with more than a couple of cars all lapping at the same pace, and it’s a Hell of a thing to experience! Jake lost power coming out of the hairpin and fell off the group with a few laps to go, and I had few goes side-by-side in Gerrards with Andrew, both looking over at each other as we slid around trying not to take each other out but not giving an inch! Tom came very close to my rear wheel as I backed out of a dive up the inside of Andrew – something I watched very carefully in my mirrors and was impressed he’d managed to avoid any contact as he also made a dive for it! 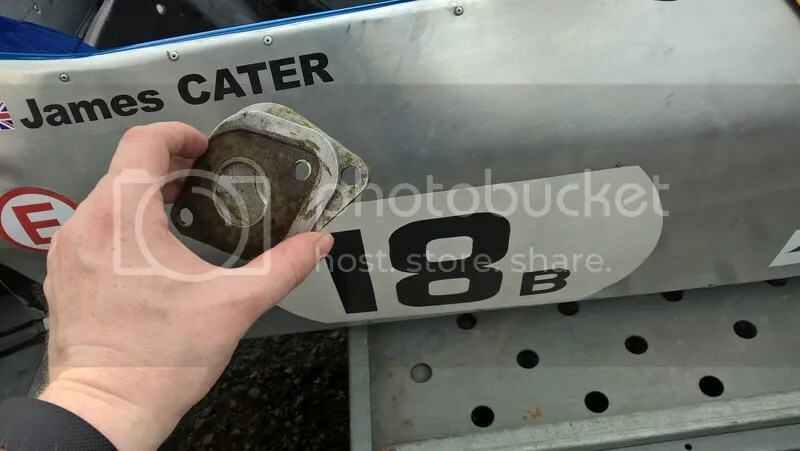 A number of cars in parc ferme after the race were taken apart for checks, and Dallas (in his 49th year scrutineering Formula Vee), found one of our restrictor plates was out of tolerance by a tiny margin. Despite the plate being stamped and certified, the rules are the rules, and this meant I’d be excluded from the race for a technical infringement. This was a shame after what may have been one of my greatest driving performances – especially after racing so closely with a pack. If the part wasn’t to spec, then it’s much better that it’s been picked up now than if I’d have been missing out on a trophy. I could challenge the decision as I have no evidence that the tool used to check had been calibrated, but is it really worth the hassle? I’m going to put my trust in the 750 Motor Club, and if it were found that the tool wasn’t accurate I’m sure they’d sort something out retrospectively. 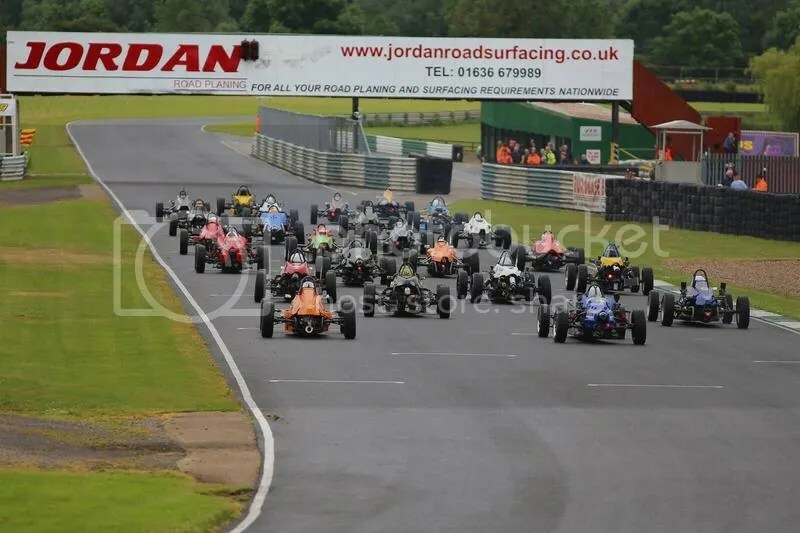 Both races were won outright by Paul Smith, and after James Harridge dropped out with engine problems in the first race, there was nobody else able to challenge him. That makes it 8 wins from 8 races this year for Paul! Pretty amazing stuff! Jack Wilkinson took both of the B class trophies on his return to Vee. Next month will see a visit to the Anglesey Coastal circuit in North Wales – a circuit I’ve always liked the look of. If I can get on the pace straight away it could yield some good results for me!